I just have to wait another thirty hours to see The Hunger Games. 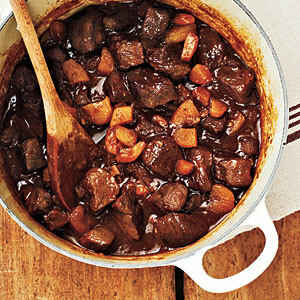 Until then, I will have to be satisfied with making Katniss’s lamb and dried plum stew for dinner tonight, mentioned several times in the book as her favorite Capitol dish. Otherwise known as lamb tagine. Of course, as an Ashkenazi Jew, my family recipes run to things like gefilte fish and chicken soup. Still, this food, these spices, run through my blood somehow. After all, Jews were all Sephardi before we were kicked out of Spain, weren’t we? Best eaten alongside a boy named Peeta. Slop a little olive oil into an ovenproof dutch oven, like a le Creuset. Heat it up, add the diced onions. Let them soften and become clear. While that’s going on, wash and drain the meat. Sprinkle the salt, cinnamon and coriander over it, and with your fingers, work the spices into the lamb. Yes. This part is gross. Drop teabag into 2 cups of boiling water. Steep. Scrape the lamb pieces into the pot. Throw in the prunes, drip in the honey. Stir everything together. Discard teabag, add tea to pot. When this is done, cover the pot. Slide pot into an oven heated to 325. Let tagine braise at low heat for around three hours, checking a couple of times to make sure that there’s still liquid. It’s done when the lamb is soft enough to eat with a spoon. Serve over couscous, (I like the round, pearly Israeli kind) cushioned beside some chunks of butternut squash. Et, voila! May the odds be ever in your favor. Ooh, this sounds great! The tea is an interesting touch. I’ll just have to try it one of these days. Hi, Iza! Sorry it’s taken me so long to respond. Yes, the tea is the finishing touch!